Anthony Gose does not have any MLB stats for the season. Draft: 2008, Philadelphia Phillies, 2nd rd. Last name is pronounced: goes... Graduated from Bellflower High School (CA) in 2008...hit .443 with 31 stolen bases as a senior in 2009...also excelled as a pitcher as he owned a 0.63 ERA and struck out 124 batters...earned Rawlings First Team AllAmerican honors his senior season...Selected by Philadelphia in the second round (51st overall) of the 2008 draft as an outfielder... Was originally acquired by Houston with Jonathan Villar and J.A. Happ from Philadelphia in exchange for Roy Oswalt on July 29, 2010...that same day, the Astros traded him to Toronto in exchange for Brett Wallace...Signed as a minor league free agent with Texas on Dec. 4, 2017...was selected by Houston from Texas in the Major League Rule 5 Draft on Dec. 14, 2017...as a Rule 5 pick, he must remain on the Astros active roster for the entire 2018 season, or be offered back to Texas. Spent the entire 2017 season in Class A Lakeland as he converted from outfielder to pitcher...made 11 relief appearances for the ballclub, going 0-2 with a 7.59 ERA (9ER/10.2IP) while fanning 14 batters and issuing six walks... held a 19.29 ERA (5ER/2.1) after allowing at least a run in each of his first three professional pitching outings...did not allow a run to score in consecutive appearances from June 9-12 before surrendering a season high four earned runs on June 15 at Clearwater...allowed only one hit and no runs over his final five games of the year spanning 6.1 innings...lowered his ERA from 18.69 (9ER/4.1IP) to 7.59 (9ER/10.2IP) during that span. Finished his first season with the Tigers in 2015 and established career highs in games played (140), at-bats (485), runs scored (73), hits (123), doubles (24), triples (8), home runs (5), RBI (26), walks (45), stolen bases (23) and multi-hit games (32). Ranked ninth in the American League with 23 stolen bases, while he was tied for ninth with eight triples. Had consecutive three-hit games on April 8 and April 9 vs. Minnesota -- became the first Tigers player to record two three-hit games in the first three games of a season since Austin Jackson in 2012. Hit his first career leadoff home run on April 15 at Cleveland off Corey Kluber -- also hit a leadoff home run on September 3 at Kansas City off Edinson Volquez. Posted a .314 (16 for 51) batting average with eight runs scored, three doubles, one triple, one home run and six RBI in April. Recorded the first four-hit game of his major league career on May 14 vs. Minnesota, finishing the game 4 for 5 with two runs scored and a triple. Hit .314 (33 for 105) with 13 runs scored, seven doubles, two triples and five RBIs in 27 games during the month of May. Hit safely in a career-high 11 straight games from June 28-July 17, batting .385 (15 for 39) with eight runs scored, four doubles, one triple, one home run and three RBI during the streak. Reached base safely in 16 straight games from September 1-20, establishing a new career high. Compiled a .192 (14 for 73) batting average against lefthanded pitchers...hit .265 (109 for 412) vs. righthanded pitchers. Posted a .265 (65 for 245) batting average at Comerica Park...batted .242 (58 for 240) in road games. Hit .282 (72 for 255) with 38 runs scored, 13 doubles, four triples, two home runs and 13 RBI before the All-Star break...hit .222 (51 for 230) with 35 runs scored, 11 doubles, four triples, three home runs and 13 RBI following the All-Star break. Appeared in a career-high 94 games as he spent the majority of the season at the major league level with the Blue Jays in 2014...Assigned to Triple A Buffalo to begin the season...Recalled from Buffalo by Toronto as the 26th man for that day's doubleheader on April 17 -- optioned back following the games...Recalled from Buffalo by Toronto on May 1 -- knocked a season-best two RBI that same day...Optioned to Buffalo by Toronto on May 4...Recalled from Buffalo by Toronto on May 15...Batted .295 (14x44) with four runs scored, three doubles and three RBI in 18 games during May...Optioned to Buffalo by Toronto on June 17...Recalled from Buffalo by Toronto on June 23...Optioned to Buffalo by Toronto on July 4...Recalled from Buffalo by Toronto on July 12...Swiped two bases in back-to-back games July 22-23 versus Boston...Optioned to Buffalo by Toronto on August 15...Had back-to-back four RBI games on August 19 and 20 versus Rochester...Stole four bases on August 21 versus Scranton Wilkes-Barre...Batted .244 (50x205) with 29 runs scored, five doubles, two triples, four home runs and 25 rBI in 51 games with Triple-A Buffalo...Recalled from Buffalo by Toronto on September 2...Scored a career-high three runs on September 10 versus Chicago. Appeared in 52 games in two separate stints with the Blue Jays. Connected for his 1st career grand slam September 10 vs. LAA. Finished the season T-1st on club with 5-3B (Kawasaki) with only 153 plate appearances. In first stretch with the parent club, May 20-June 5, played 13 games posting a .304 average with two doubles, three walks and five strikeouts. Was recalled August 16 and remained with the team until the end of the season appearing in 39 contests with a .250 average while collecting four doubles, five triples, two home runs, four stolen bases, two walks and 32 strikeouts. Appeared in 106 games with Buffalo (AAA) this season batting .239 with 17 doubles, six triples, three home runs and 22 stolen bases…Also recorded 15 outfield assists. Played winter ball in Venezuela, batting .160 in seven games. Appeared in 56 games in his rookie season in two separate stints with the parent club...Made his Major League debut on July 17 at NYY, going 1-2, with his first hit coming on a bunt single...Stole 15 bases in 56 games...The 15 steals are T-3rd among Blue Jay rookies, behind Alfredo Griffin (23 in 153G) and Junior Felix (18 in 110G)...The 15 steals are the most since Alex Rios stole 15 in 2004 (111G)...Sept. 8 at BOS hit his first Major League home run with 3-run shot off Andrew Bailey...Also recorded 5RBI in the contest becoming the first Blue Jay rookie to do so since JP Arencibia on April 1, 2011...Hit in five straight games from Sept. 24-28, going 5-16...Oct. 1, produced a walk-off single in the bottom of the 10th for a 6-5 win vs. MIN...Started 21 games in RF, 15 in CF and 13 in LF...Had two outfield assists, both coming in LF...Appeared in 102 games for Las Vegas (AAA) batting .286 with 21 doubles, 10 triples, five home runs, 43 RBI and 34 stolen bases...Batted .313 vs. right-handed pitchers and .176 vs. left-handed hitters...Named to the SiriusXM All-Star Futures Game...Singled and walked in his two plate appearances. Played the entire season at New Hampshire, his first season at the AA level and first full season in the Blue Jays organization... SOME RECOGNITION: Was named to the Eastern League Post Season All-Star team and was selected by Eastern League Manager's as the fastest Baserunner in a Baseball America poll... AND THEY'RE OFF: Posted 70 stolen bases to lead the Eastern League... The 70 steals also ranked 2nd in all of minor league baseball and was the 5th highest total in Blue Jays minor league history... Was caught only 15 times for a 82.4% success rate... MORE THAN JUST SPEED: Added 16 home runs after having nine in his first three professional seasons, while registering 43 extra base hits... His 62 walks, .415 slugging percentage and .763 OPS are also career highs... Defensively, committed just three errors while adding 14 assists in 137 games... Batted .340 with runners in scoring position and 2-out (18-53), with five home runs... CONSISTENT: Batted .252 vs. left-handed pitchers and .254 vs. right-handed pitchers... OFF-SEASON: Played in the Arizona Fall League, posting a .250 average with five doubles, four triples, three home runs and 19 RBI... Also particpated in the Venezuelan Winter League, hitting .182 with two RBI. Began the season with Clearwater (A) in the Phillies organization before being acquired by the Blue Jays on July 29, 20010 in exchange for 1B Brett Wallace... Joined the Dunedin Blue Jays (A) for the balance of the season... Overall appeared in 130 games, batting .262 with 20 doubles, 13 triples, seven home runs and 45 stolen bases... PRE SUMMER HEAT: Enjoyed his best two months in May and June, combining to hit .291 with 10 doubles, six triples and three home runs... JAY DAYS: Collected hits in six of his first seven games, including two three-hit contests... When leading off an inning for Dunedin, batted .324 (11-34), and overall hit .293 (55-188) in such situtaions for all of 2010... Finished the season ranking 1st in the Florida State league in stolen bases (45), T-1st in triples (13), 2nd in runs (88), 7th in hits (134) and T-9th in total bases (201). Spent season with Lakewood (A)... Led all minor league players in stolen bases (76)... Led South Atlantic League in atbats (510) and was 4th in triples (9)... Named to SAL Mid-Season All-Star team... Had a professional high four stolen bases,May 31... Hit .407 in six post-season games with Lakewood. Began pro career with the Gulf Coast Phillies... Hit safely in nine of 11 games. 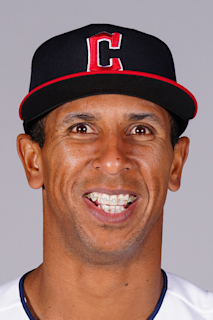 March 17, 2019 LHP Anthony Gose assigned to Cleveland Indians. October 5, 2018 LHP Anthony Gose elected free agency. June 8, 2018 CF Anthony Gose assigned to Frisco RoughRiders from Down East Wood Ducks. March 9, 2018 LHP Anthony Gose returned to Texas Rangers from Houston Astros. March 9, 2018 LHP Anthony Gose assigned to Round Rock Express. December 14, 2017 Houston Astros claimed LHP Anthony Gose off waivers from Round Rock Express. December 4, 2017 Texas Rangers signed free agent LHP Anthony Gose to a minor league contract and invited him to spring training. December 4, 2017 LHP Anthony Gose assigned to Round Rock Express. November 6, 2017 LHP Anthony Gose elected free agency. September 8, 2017 Lakeland Flying Tigers activated LHP Anthony Gose from the 7-day disabled list. May 22, 2017 Lakeland Flying Tigers placed LHP Anthony Gose on the 7-day disabled list. February 23, 2017 Detroit Tigers invited non-roster LHP Anthony Gose to spring training. January 25, 2017 Detroit Tigers sent Anthony Gose outright to Toledo Mud Hens. January 18, 2017 Detroit Tigers designated CF Anthony Gose for assignment. October 3, 2016 Detroit Tigers recalled CF Anthony Gose from Erie SeaWolves. July 13, 2016 CF Anthony Gose assigned to Erie SeaWolves from Toledo Mud Hens. May 16, 2016 Detroit Tigers optioned CF Anthony Gose to Toledo Mud Hens. November 13, 2014 Toronto Blue Jays traded CF Anthony Gose to Detroit Tigers for 2B Devon Travis. September 2, 2014 Toronto Blue Jays recalled CF Anthony Gose from Buffalo Bisons. August 15, 2014 Toronto Blue Jays optioned CF Anthony Gose to Buffalo Bisons. July 12, 2014 Toronto Blue Jays recalled Anthony Gose from Buffalo Bisons. July 4, 2014 Toronto Blue Jays optioned CF Anthony Gose to Buffalo Bisons. June 23, 2014 Toronto Blue Jays recalled Anthony Gose from Buffalo Bisons. June 18, 2014 Toronto Blue Jays optioned CF Anthony Gose to Buffalo Bisons. May 15, 2014 Toronto Blue Jays recalled Anthony Gose from Buffalo Bisons. May 4, 2014 Toronto Blue Jays optioned CF Anthony Gose to Buffalo Bisons. May 1, 2014 Toronto Blue Jays recalled Anthony Gose from Buffalo Bisons. April 18, 2014 Toronto Blue Jays optioned CF Anthony Gose to Buffalo Bisons. April 17, 2014 Toronto Blue Jays recalled Anthony Gose from Buffalo Bisons. March 24, 2014 Toronto Blue Jays optioned CF Anthony Gose to Buffalo Bisons. December 10, 2013 CF Anthony Gose assigned to Tiburones de La Guaira. August 16, 2013 Toronto Blue Jays recalled Anthony Gose from Buffalo Bisons. June 6, 2013 Toronto Blue Jays optioned Anthony Gose to Buffalo Bisons. May 20, 2013 Toronto Blue Jays recalled Anthony Gose from Buffalo Bisons. March 25, 2013 Toronto Blue Jays optioned Anthony Gose to Buffalo Bisons. September 4, 2012 Toronto Blue Jays recalled Anthony Gose from Las Vegas 51s. August 25, 2012 Toronto Blue Jays optioned Anthony Gose to Las Vegas 51s. July 17, 2012 Toronto Blue Jays selected the contract of Anthony Gose from Las Vegas 51s. April 3, 2012 Anthony Gose assigned to Las Vegas 51s. January 20, 2012 Toronto Blue Jays invited non-roster CF Anthony Gose to spring training. December 3, 2011 OF Anthony Gose assigned to Tigres de Aragua. June 16, 2011 New Hampshire Fisher Cats activated CF Anthony Gose. June 12, 2011 CF Anthony Gose suspended. April 3, 2011 CF Anthony Gose assigned to New Hampshire Fisher Cats from Dunedin Blue Jays. January 7, 2011 Toronto Blue Jays invited non-roster CF Anthony Gose to spring training. September 29, 2010 Anthony Gose roster status changed by Dunedin Blue Jays. August 29, 2010 Dunedin Blue Jays placed CF Anthony Gose on the 7-day disabled list. July 29, 2010 Las Vegas 51s Traded Brett Wallace to Round Rock Express and Lancaster JetHawks Traded CF Anthony Gose to Dunedin Blue Jays. April 5, 2010 Anthony Gose assigned to Clearwater Threshers from Lakewood BlueClaws. June 8, 2008 Philadelphia Phillies signed CF Anthony Gose.